Hide this Project (Rohan Leher) Discover properties in other projects by hiding the ones that doesn't interest you. You won't see them in your searches further but you can unhide anytime later. Hide this Dealer (Qubic Properties)Discover properties by other dealers by hiding those whom you have already spoken to. You won't see them in your searches further but you can unhide anytime later. Hide this Dealer (Arindam) Discover properties by other dealers by hiding those whom you have already spoken to. You won't see them in your searches further but you can unhide anytime later. Hide this Dealer (RATHI) Discover properties by other dealers by hiding those whom you have already spoken to. You won't see them in your searches further but you can unhide anytime later. Rohan Leher is a promising housing project, exclusively designed by Rohan Builders and Sarsan and Aawishkar Developers. Located in the heart of Baner, it houses high rise towers with unique designs. Rohan Leher offers 2BHK and 3BHK apartments, that has conventional design standards and gives a fresh living to its residents. No dark corners remain, If the light does not fall beyond 20 feet of the indoor space, an additional source of natural light is created. Utmost privacy, carefully placed windows and masterfully planned layouts, neighbours are denied any direct view to our home. Where is Rohan Leher located? Baner, a prime residential locality for house seekers in Pune. What is the area of apartments in Rohan Leher? The area of apartments offered in the project ranges from 950.0 sqft to 1600.0 sqft. 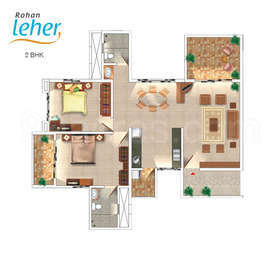 What is size of 2 bhk in Rohan Leher? The area of 2 BHK apartments ranges from 950.0 sqft to 1350.0 sqft. What is size of 3 bhk in Rohan Leher? The area of 3 BHK apartments ranges from 1340.0 sqft to 1600.0 sqft. What is the 2 bedroom price in Rohan Leher? 2 BHK units in the project are available at a price tag of Rs. 5200000 to Rs. 9100000. What is the price of 3 bhk in Rohan Leher? 3 BHK units in the project are available at a price tag of Rs. 9300000 to Rs. 13000000. Hi Shashwat, the builder has got legal approval for Rohan Leher from PMC (Pune Municipal Corporation). There are ample safety measures taken by the builder in this project. The entire society is covered under CCTV camera surveillance. Every outsider has to enter his/her details in visitors log book before entering the society. Security guards are deployed at the main entrance as well as other important areas. Extra features such as Video Doors and Intercom improves the safety quotient of this project. I am in search of a project in Pune which should ensure good returns on investment in future. Is it worth spending my money in Rohan Leher? Experts please suggest. Hi Nirupama, Rohan Leher is a ready to move project which was completed in Mar 2011. Therefore, Investing here might not be a great idea. As suggested by experts, investing in a newly completed project would be the best option since any project sees a spike in capital rates in its initial 4-5 years. To this end, you can look out for projects such as Park Grandeur, Kasturi Legacy Homes, Kalpataru Jade Residences and Kapil Akhila. All of these are newly completed projects and they have good chances of witnessing capital appreciation due to the excellent infrastructure, smooth connectivity via roadways, Mumbai-Pune Expressway and proximity to IT hubs. A metro station is also proposed for this locality, which once gets completed will not only ease connectivity here but will further catalyse the property rates here. Being close to IT companies offers the additional advantage of helping homeowners earn rental income.